When you're keeping a flight of pigeons, making sure they have food and that it's sheltered from the weather is one of your top concerns. If your pigeons' food gets wet from the rain or snow it could become moldy, which could cause health issues for your birds. Most pigeon boxes are built with tops to keep the food dry as well as keeping the pigeons from using their food box as a litter box. There's nothing fancy to the design of pigeon feed boxes. They're basic, rectangular boxes with a top, a bottom and four sides. A section along the front is open so that the pigeons can stick their heads inside to partake of the grains that make up their diet. The opening might be one large opening or it can be broken up with dowels to create an individual space for each pigeon. Just like the design of the feed box, the materials used to build one are simple. You can use plywood or any type of bird-safe wood such as ash, elm or pine. You can even repurpose used wood if you like to recycle. The only other things you need for a pigeon feed box are nails or screws, a hammer or drill with a screwdriver bit, a tape measure and a saw. A pigeon feed box needs to be big enough to accommodate all the pigeons you have, but that doesn't mean that you'll end up with a pigeon feeder as long as a football field. According to Extension specialist Kenneth S. Olson in his guide on pigeons, each pigeon only needs 2 inches of feeder space. So if you have a small flock of only 10 pigeons, your feeder can be less than 2 feet long. 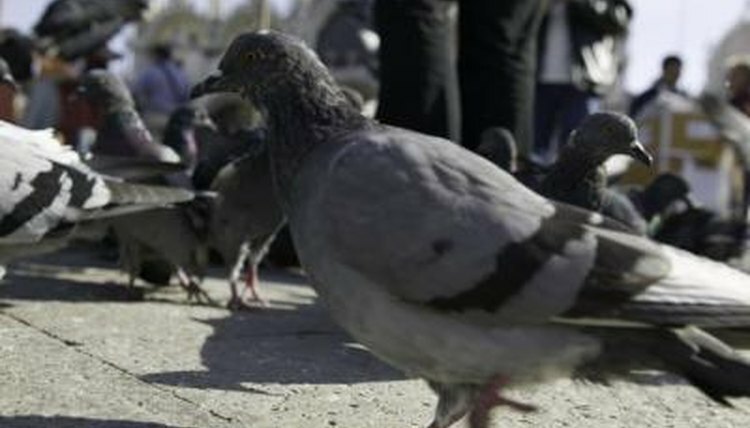 As for height, because pigeons are birds of small stature, it only needs to be 6 or 7 inches tall no matter how long it is. Whether you're building or buying a pigeon feeder box, you'll want one that has a hinged or removable lid on top. Being able to open the feeder from the top will make cleaning it easier. You'll just take the lid off or flip it open, remove any uneaten food and dust out the interior with a cloth, then pour a fresh supply of food inside before securing the lid back in place.